The End of a Long, Hot, Jobless Summer? 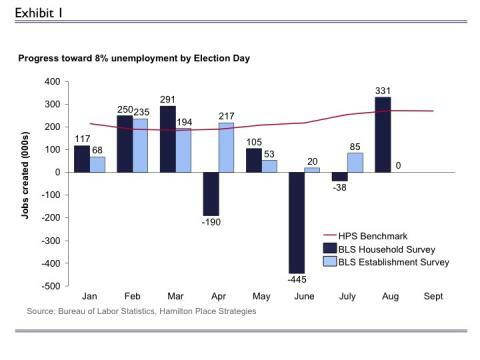 Hamilton Place Strategies has been tracking progress on job creation since the beginning of the year by benchmarking the number of jobs needed to reach 8 percent unemployment by Election Day 2012. This rate would represent a notable improvement and while still high, would allow the President to argue that he is making progress on the slow-moving unemployment crisis. This month, we are taking a look back at the year to date and the job growth that wasn’t. The first quarter saw good job growth headed in the right direction. Growth was above the HPS benchmark, and the President was on track to be able to point to significant improvement in the jobs climate. That progress began to come apart in April with a bad Household Survey (the Labor Department’s survey of individuals that determines the unemployment rate), and over the summer months we saw the same downward spiral in the Establishment Survey (the less volatile survey of businesses). While the HPS benchmark declined in the first quarter to 185,000 jobs needed per month in March, after a long, hot, jobless summer it has climbed back up. The President now needs 270,000 jobs in the September report and every month going forward to get unemployment below 8 percent by Election Day. To get below a more modest rate of 8.5 percent, the President would need 215,000 jobs per month between now and the election. The economic forecasts for job creation next year have not offered much hope for significant renewed job growth to bring the unemployment rate down, and spillover dangers from the European sovereign debt crisis have elevated the risk of a second recession. On the bright side, the only thing worse than the job market this year has been the consensus forecasting that didn’t predict it. If Americans are lucky the jobs forecasting will be as inaccurately pessimistic for 2012 as it was inaccurately optimistic for 2011.